On an unseasonably warm Friday afternoon, on 3 October 2014, the Swedish icebreaker Oden returned to Tromsø, northern Norway, after 90 days cruising the cold waters of the East Siberian Arctic Ocean. The massive 100-meter-long, blue-yellow-red vessel glistened in the October sun, as it zipped through the fjord, towering over passing boats, to eventually drop anchor just two kilometres from Tromsø city centre. By 5pm that evening, all scientists and crew had gone ashore marking the end of SWERUS-C3, an international research expedition to the East Siberian Arctic Ocean that had taken them from Tromsø to Barrow, Alaska, along the East Siberian coast, and back to Tromsø. 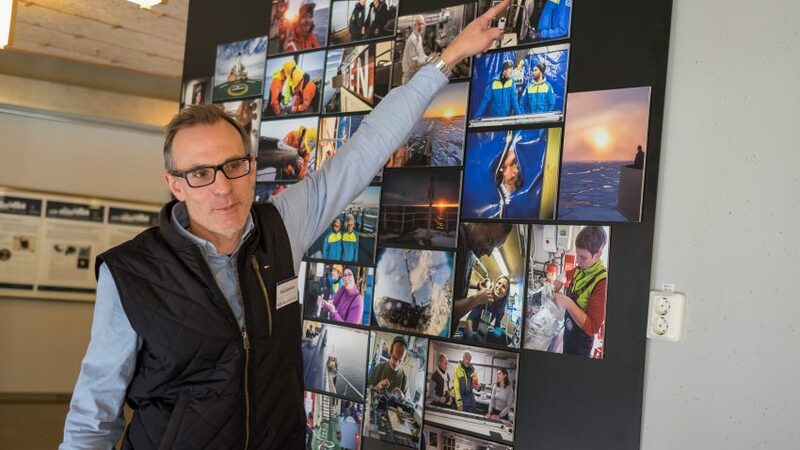 Today, a little more than two years later, participants of the three-day symposium “Bolin Days 2016” organised by the Bolin Centre for Climate Research, Stockholm University, were offered a unique glimpse into the world of SWERUS-C3 via a series of 86 never-before seen photographs taken by expedition scientists. 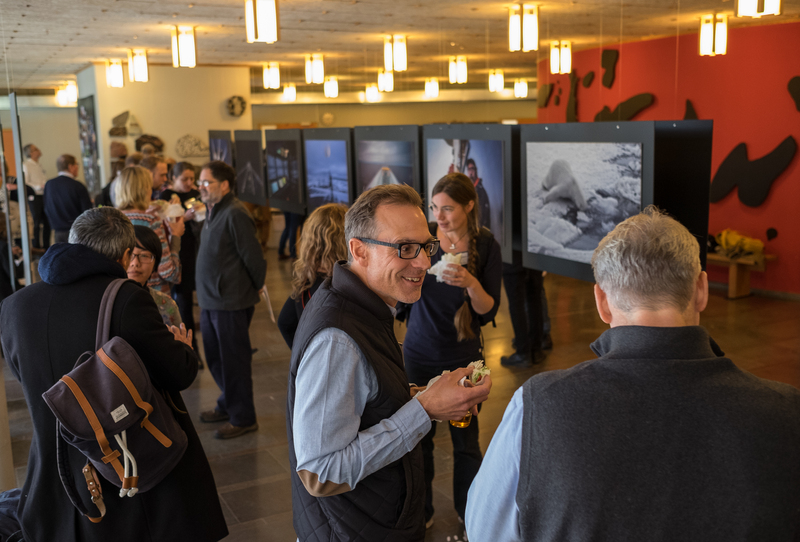 Snapshots of life on board, wildlife encounters, participant portraits and Arctic landscapes were on display in a unique photo exhibition, which opened for the public at the Nordensskiöld foyer in the Geosciences Building, Stockholm University. “It’s a great collection of images from an international research expedition,” said Örjan Gustafsson, Professor at ACES and chief-scientist on SWERUS-C3. Together with Martin Jakobsson, Professor at the Department of Geological Sciences, Örjan led the project from the beginning, when it was only an idea. “I remember both Martin and I were on skiing holidays with our families when we began writing the grant application. We would ski all day long then sit in front of the computer and write until 4am. We communicated via email during that time. It was all done remotely,” he said during his welcome speech. A few expedition participants who contributed images to the exhibition were present at the opening. Johan Nilsson, Professor at the Department of Meteorology, was one of them. “ I was surprised to find out that two of my images were selected for the exhibition. I remember I had problems with the camera focus and most of my pictures had turned out blurry,” he said while browsing over his quirky painting-like image showing a sheet of “pancake ice” forming a wave. The SWERUS-C3 photo exhibition will be on display at Nordensskiöld foyer until 28 November. SWERUS-C3 was an international research expedition to the Arctic Ocean that took place during the summer of 2014 using the Swedish icebreaker Oden. It was a Swedish/Russian/American collaboration and some 80 researchers from 14 countries operated in the northern stretches of the Laptev Sea, the East Siberian Sea and the Chukchi Sea. The purpose of the expedition was to study the interactions between the thawing cryosphere, the carbon system and the climate system.